Red Bull Air Race began in 2003. The championship is based on the annual points accumulation from eight races in scenic urban locations around the globe — including places such as France, Budapest and Russia. 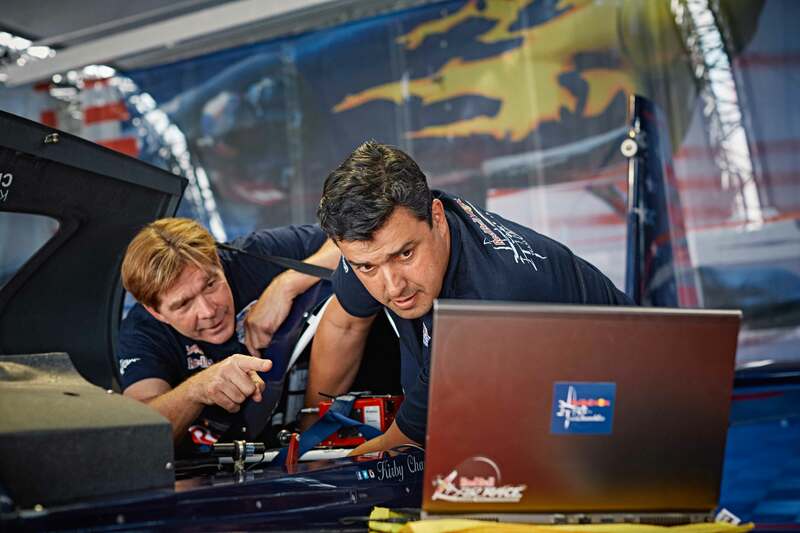 Each Red Bull Air Race pilot works closely with a team, which is similar to a Formula One race car pit crew. In his role with Team Chambliss, Iscold modifies the plane’s aerodynamics and control systems. Then he uses software he created to analyze each course. “A big part of my job is to help the pilot find the optimum line,” Iscold said. That sophisticated software allows Iscold to look at a variety of parameters, including the aircraft’s bank and pitch angles, acceleration and more. He uses that information to create a simulation video over the race course. The pilot then tries to imitate what the plane on the video does. Iscold grew up in Brazil, where his father was an engineering professor who designed planes. But his main mentor was Claudio Barros, an aeronautical engineer and legendary aircraft designer there. As Barros conducted research, Iscold became his star pupil — and was instrumental in helping him digitize his data. With Barros’ encouragement, Iscold and his students went on to design multiple planes that broke world speed records. 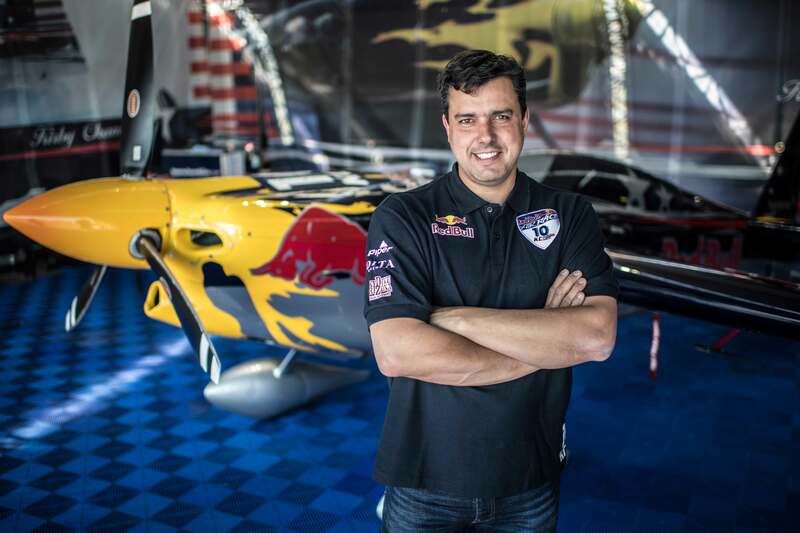 Eventually, Iscold became a part of Red Bull Air Race. When British pilot Paul Bonhomme became the event’s most successful pilot, Iscold was considered Bonhomme’s “secret weapon,” helping him win two championships. When Bonhomme retired, Iscold was hired to help the elite Chambliss team, which is third on the all-time wins list. During his Red Bull Racing career, Iscold has traveled the world — to Europe, Malaysia, Japan and Abu Dhabi. While his attendance is key to the team’s success, his busy teaching schedule makes for a hectic itinerary. That will be especially challenging when he travels to Abu Dhabi, on the Persian Gulf, for the Feb. 3 event. Race courses are different each time. And race teams are typically given the coordinates for each course two weeks before the race. That’s when Iscold has to work his software to create a flight simulation for Chambliss. “Just watching the video, he can memorize how to fly,” Iscold said. Iscold also collects data from the pilot’s three test runs and compares it to the optimal line he created, to have Chambliss make adjustments. While he enjoys the competitive challenge of air racing, Iscold’s main job, he said, is to teach others. As a professor in Brazil, he helped students design three planes. At Cal Poly, he is currently working with students on a sailplane — an engine-less aircraft with a 93-foot wingspan. Iscold especially likes propeller-driven planes. And he’s drawn to speed records.